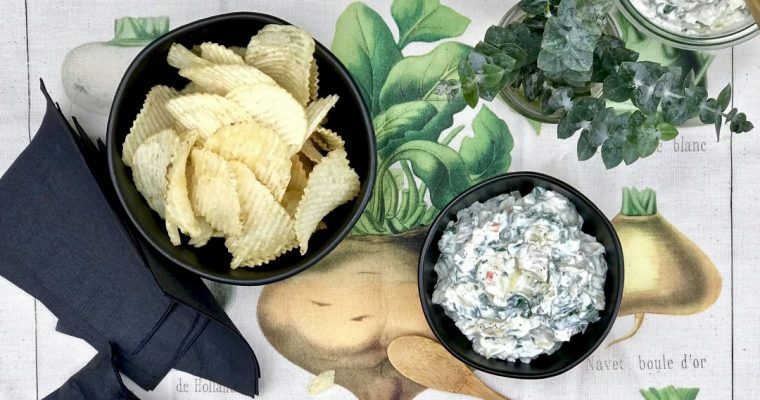 The Super bowl is approaching, and whether you are football fan or not, it’s a time for fun casual gatherings and tasty snack food that is undoubtedly indulgent and unhealthy. I have always maintained the belief that all things in moderation are fine. Honestly, I believe that. I feel this approach prevents being too overindulgent with things since one has not completely deprived themselves of treats. This works for me and my family, but not everyone and I get that. This year I wanted to approach Super Bowl Sunday from a slightly healthier prospective. 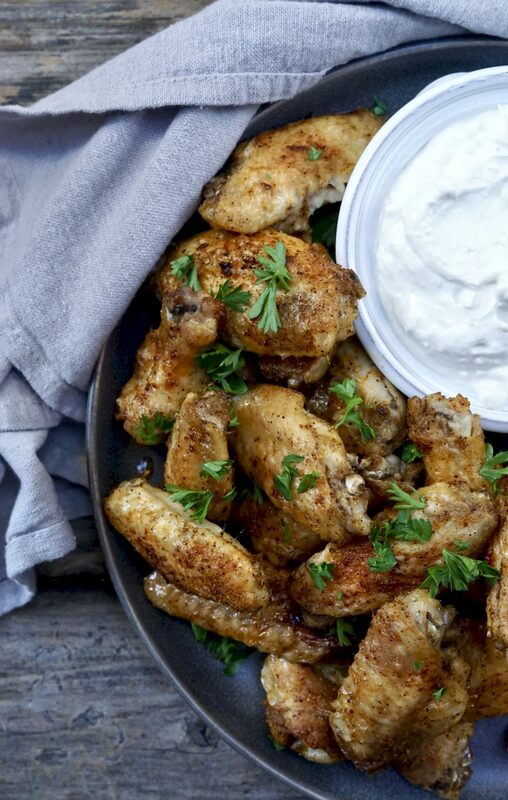 Meet my baked chicken wings, aka as my version of “America’s favorite Super Bowl food”. Easy, flavorful wings that can be made hot or not depending on your desire. 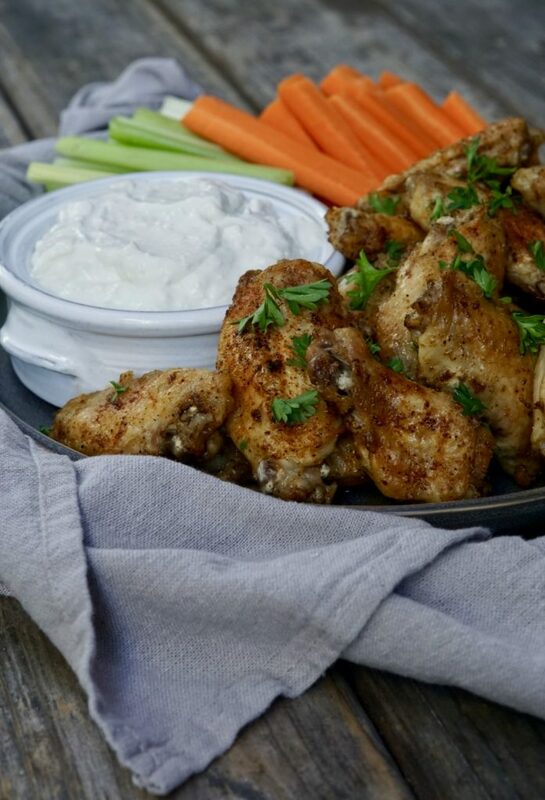 These delicious little wings are great for big group gatherings, can be prepped ahead and baked off when needed. My kids absolutely loved them. My boys opted for eating them straight up, my husband added hot sauce and I went classic with a side of tasty homemade blue cheese dip. 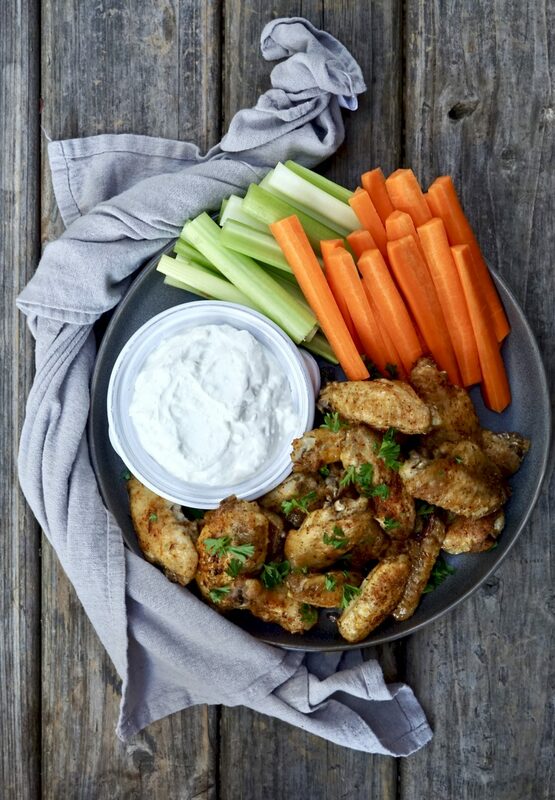 Toss in some celery and carrot sticks and you have a classic football party food that won’t do too much damage to your waist line. 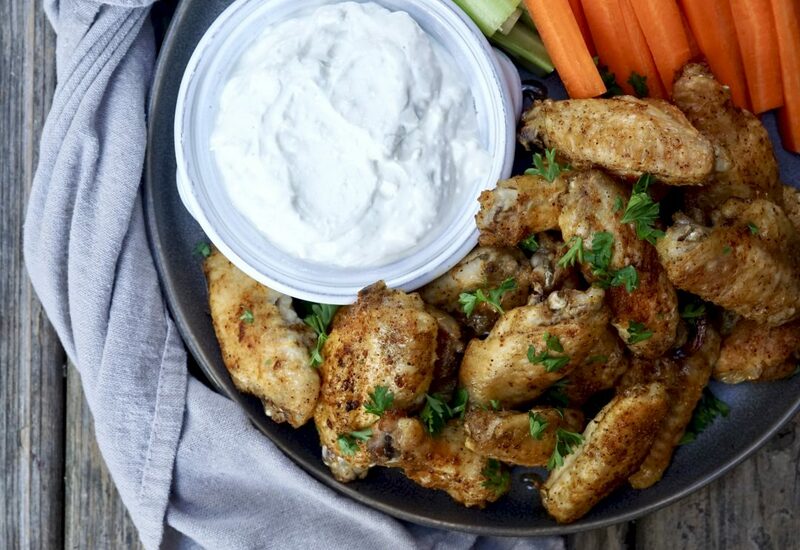 So historically, what’s America’s obsession with wings on game day all about anyway? NPR wrote an article that came out in 2013 addressed this very question. The chief economist for The National Chicken Council believes that “the magical paring of humongous athletes and itty-bitty chicken parts began decades ago. 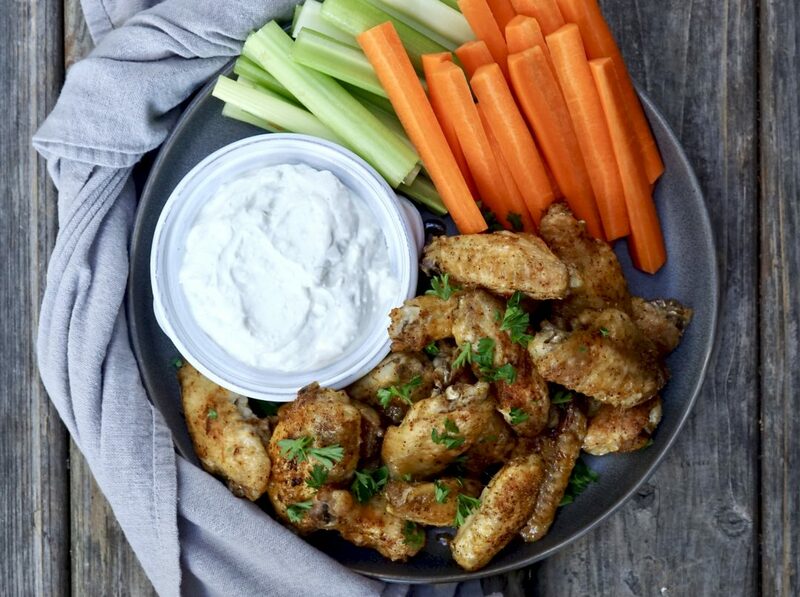 Sports-watching demands cheap munchies, and wings were both convenient and cheap.” Wings became so popular, The National Chicken Council actually began predicting and tracking wing consumption on game day. In 2018 The National Chicken Council estimated fans would consume 1.35 billion wing during the Super Bowl weekend. This was an all-time high prediction and up 1.5% from 2017. If 1.35 billion wings were laid end to end along Interstate 95, they would stretch from Lincoln Financial Field in Philadelphia to Gillette Stadium in Foxboro, Mass. almost 250 times. That is enough wings to put 625 wings on every seat in all 32 NFL stadiums (counting MetLife 2x). Ironically, the “cheap snack” is not as cheap as it once was. 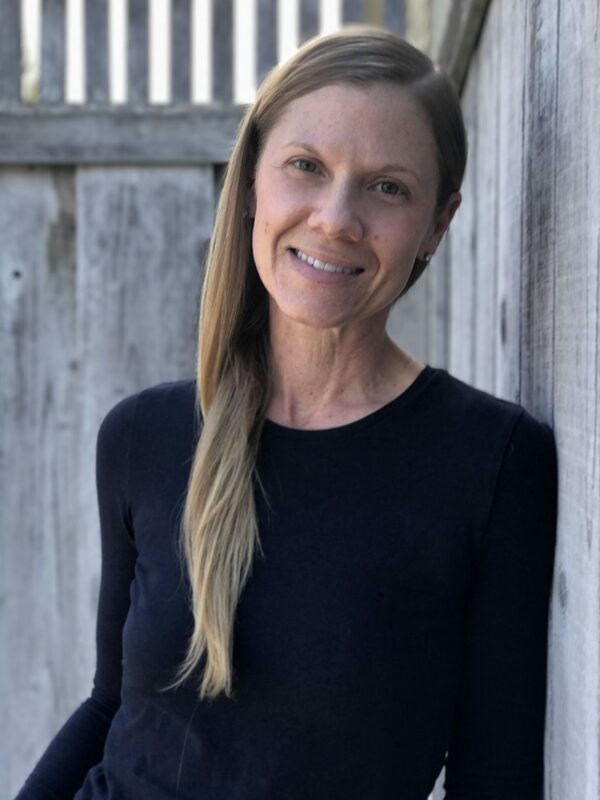 From what the National Chicken Council reports, wing prices tend to increase in the fourth quarter of the year as restaurants and supermarkets stock up for the Super Bowl, and prices usually peak in January during the run-up to the big game. Price aside, I think it’s safe to say, if you make chicken wings, they will be consumed. 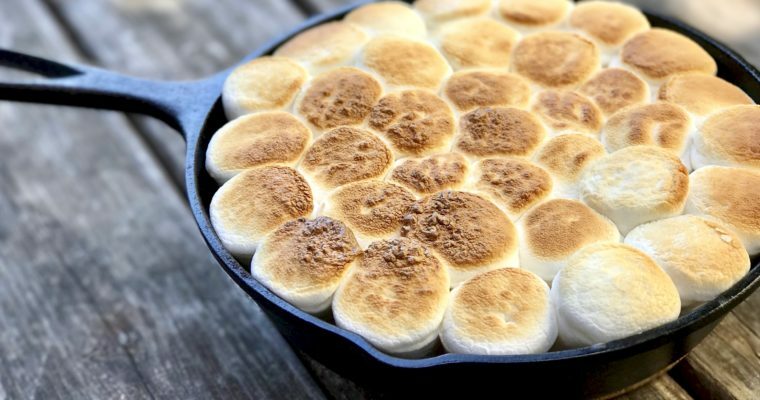 This year, try my baked version and feel just a little less guilty the day after. Step 1 Preheat the oven to 400 degrees F. Lightly oil two baking sheets. Step 2 Divide the dried chicken wings onto the prepared baking sheets, toss with the vegetable oil. Set aside. Step 3 In a small bowl add the salt, pepper, brown sugar, chili powder paprika, cumin, dried mustard, garlic powder, onion powder, cayenne pepper and oregano and mix to blend. Step 4 Sprinkle the spice rub over both trays of chicken. Using your hands, rub the spice mixture all over the chicken wings making sure to coat both sides. Spread the wings out evenly in one layer. Place in the oven and bake, rotating once, until crispy and beginning to turn gold brown, about 45 minutes. Serve with blue cheese dip. Step 1 In a small mixing bowl, use a masher (or fork) to mash the blue cheese. 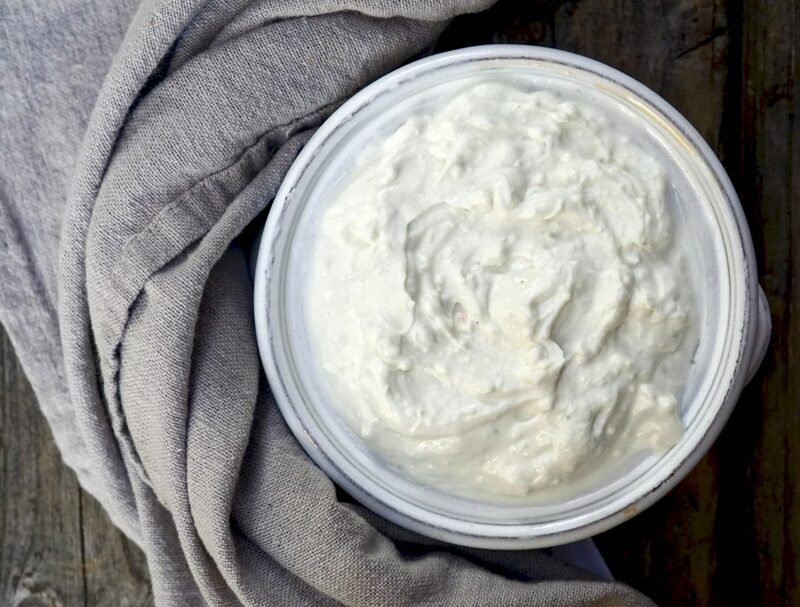 Step 2 Add the yogurt, mayonnaise, sour cream, lemon juice, vinegar and garlic powder and mix well to blend. The baked chicken wings were amazing! So easy and DELICIOUS. My whole family devoured them. We will make them again for sure! Love hearing this Sara!!!! Thanks so much for trying my recipe and telling me about it, you rock.